← Exciting News Released for Queensland Researchers! A couple of months ago I posted information about the In Time and Place conference being held at Riverglenn at Indooroopilly in Brisbane’s west on 3 and 4 October. This conference, Queensland’s first local, family and social history conference, was a joint venture for History Queensland, Genealogical Society of Queensland, and Queensland Family History Society. The program was divided into two streams: Family History and Local History. Overall, the presentations were excellent and many demonstrated clearly the nexus between family and local history. I presented a paper entitled Proving your point: evidence and citation unlocked. This paper was a collaborative effort with Janice Cooper and Janice Wellard. By way of introduction I explained that the idea of developing a structure for citing sources relevant to family history had grown out of workshops and discussions at GSQs Writing Group and more generally at GSQ. Our proposed system is a ‘work in progress’ and draws from the classic reference by Elizabeth Shown Mills’ Evidence Unlocked (Mills, Elizabeth Shown. Evidence Explained: Citing History Sources from Artifacts to Cyberspace. Third edition. Baltimore: Genealogical Publishing Co., 2009. ), but has been adapted to an Australian context. The paper sought to convince attendees of the value and advantages to be derived from appropriately citing source material in order to reach convincing conclusions in their research. 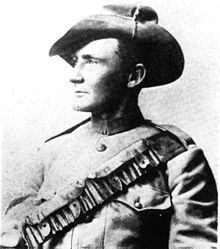 It included a case study of documentation relating to Harry ‘Breaker’ Morant. The sources used in the case study were then used as examples for the basic elements of citation, viz. original and derivative sources both print and electronic. These four elements of citation are presented below, together with examples drawn from the Harry ‘Breaker’ Morant case study. Muttaburra Hospital, Patient history book, Henry Morant, Item ID302396, Queensland State Archives, Brisbane. Court of Petty Sessions, Charters Towers, EH Morant’s charge sheets for larceny of pigs and a saddle, Image ID2804, digital image, Queensland State Archives, http://www.archives.qld.gov.au/, accessed 13 July 2015, digitised from Item ID1137578, pp229-230, Queensland State Archives, Brisbane. Queensland State Archives, Assisted Immigration 1848-1912, database, http://www.archives.qld.gov.au/ accessed 6 June 2015, M-p857, 5 June 1883, citing from Index to Registers of Immigrant Ships’ Arrivals 1848-1912, Series ID13086, Queensland State Archives, Brisbane. Queensland Registry of Births Deaths and Marriages, Marriages, Murrant-O’Dwyer, 1884, C825, database, www.qld.gov.au/law/birth-deaths-marriages-and-divorces/family-history-research/, accessed 2 August 2015. We have already undertaken some work on developing a structure for citing other types of source material that are regularly used in family history research. We welcome any comments on the proposed structure set out above as well as suggestions for additions to this structure. These can be directed to Janice Cooper at janice.cooper@bigpond.com.